Much of the appeal of the Nintendo Switch is that it's a game console you can easily liberate from its wires and take with you wherever you may roam. That unwired philosophy originally didn't extend to the headphones, though, so you still had to jack them in with a wired connection as though this were 1989 and you were playing Tetris on a Game Boy. But, rejoice! The wired bonds have been broken! (Sort of.) 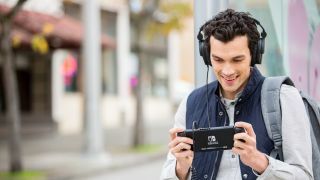 As some enterprising and experimentally minded folks over at Reddit recently discovered, the Switch now supports wireless USB headphones in both the Switch's docked and undocked modes as of yesterday's 4.0.0 firmware update. And the strangest thing? We haven't heard a peep about it from Nintendo itself. There are just a couple of catches: if you want it to work in the undocked mode, you'll need to have a USB-A to USB-C adapter plugged into the bottom of the device. It's a small annoyance, though, and probably worth it if you'd prefer not to get tangled up in cords while playing The Legend of Zelda: Breath of the Wild. It also doesn't seem to work with all USB wireless headsets, although multiple users confirm the PlayStation Gold and Platinum headsets work fine. The Corsair Void and the Logitech G933, sadly, are apparently incompatible. Perfection, of course, would have been the ability to use Bluetooth headphones as well, but unfortunately that's not happening today. But the allowance of USB wireless peripherals brings us one step closer to true unwired freedom than we were yesterday, and that's cause for celebration.